Thinking of dropshipping? This guide contains information about dropshipping, what it is, pros and cons and resources to get you started. No need to hold stock. Drop shipping allows web site owners to send single or low quantity unit orders gathered on their web sites to manufacturers, or wholesale warehouses, who in turn ship the items directly to the customers of the web site owner. Typically you take care of the promotion and collect the payment, and the drop shipper looks after order fulfillment. You buy at a low wholesale price. Drop shippers can buy in huge volumes this means they will be able to offer you the best prices on products and shipping, usually wholesale. No money up front to buy stock. There's no capital investment, no need to invest in stock and no danger of you suddenly having large stocks you are unable to sell. You can sell a wider product range without buying stock. 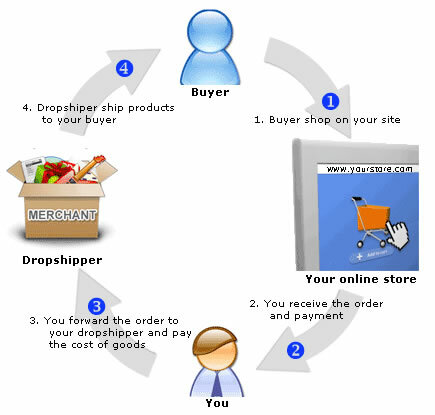 Using drop shipping allows you great flexibility in terms of product range. Promote as much or as little as you wish. No need to worry about inventory and delivery. You can focus on listening to the market and discovering the products your visitors want to buy. Prices. Don't accept that the first drop shipper you come across will give you the best deal you should shop around. Drop ship fees and charges. It's important to know all the costs involved so you can calculate your profit margins accurately. Any wholesale company that wants to charge you a regular "participation" fee should be avoided - the only time you should have to pay a dropship company anything is in connection with a specific order. Shipping. Is the drop shipper using a reputable shipping company o deliver the goods? Where will they ship to? Accounts. Will the drop shipping company automatically debit your credit card on each order you submit, or can you get monthly payment terms? Support, returns and refunds. The last thing you'll want is to be caught up in a nasty situation where you have a number of returns - and have to foot the bill. Ask the dropshipping company about their returns policy, what kind of support they'll offer you for their products and about any guarantees associated with their products - and get it in writing. Credibility. How long have the drop shippers been around for? Do they respond to your requests for information rapidly and professionally? Young dropship companies and wholesalers have the habit of going bust quickly, or growing too rapidly and as a consequence basic good customer service suffers. How do I get started dropshipping? Its fairly easy to get started, the barriers to entry are low and you shouldnt have to invest much money up front. How do I find drop shipping friendly suppliers? You can always contact wholesalers directly asking them if they operate a dropshipping program. You can usually find details by searching on the internet. Searching for the terms "drop shipping" or "drop ship" along with your area of interest usually gives pretty good results.